Have you heard of Constant -Content? C-C pays well and you can select a topic and submit an article and fix your own price. 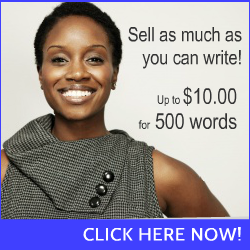 C-C will market your article and when it is sold C-C shares the revenue in the ratio 35:65. So, a 100$ article will fetch you 65$. The downside to C-C is their tough editorial stance and permanent suspensions without giving reasons, at times. WLE is a new site launched this March which encourages good writers to ghost write for their clients.With no fear of suspension, an original content writer can join, learn, earn and thrive in the freelance writers' world. The payout threshold is only 5$. You can withdraw every week so long as you exceed 5$, via Paypal. The payment is once a month, I think. The site is genuine. The rates may not be good enough for the 'native English' writers but most international writers will be happy with this new writing site.